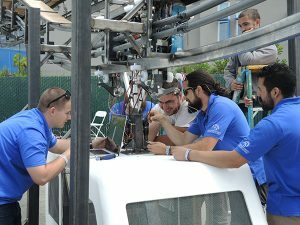 San Jose State University’s Charles W. Davidson College of Engineering Aviation Program was recently ranked first on the West Coast and fourth in the nation by the Best Colleges website. The website ranks schools based on a variety of factors such as tuition, retention rates and the median starting salary for graduates. The site acknowledges the history of SJSU’s Department of Aviation Technology, which was founded in 1936 when math students expressed a desire to study flight. During World War II, SJSU was one of 13 U.S. schools to become part of the Civilian Pilot Training Program. The department currently offers two bachelor’s programs – in Aviation and Industrial Technology – that allow students to specialize in operations, maintenance management, aviation management or professional flight. Department Chair Fred Barez said the ranking is due to the achievements of faculty, staff and students, noting that students regularly participate in conferences and competitions across the country. SJSU students work on a Spartan Superway project as part of the Engineering Projects in Community Service (EPICS) course. San Jose State University’s Charles W. Davidson College of Engineering launched a pilot of an Engineering Projects in Community Service (EPICS) course in 2016 to provide service learning and project-based opportunities to undergraduate students. Originally started at Purdue University 20 years ago, the EPICS program is now offered at more than 25 universities. The student teams are interdisciplinary and work for real-world nonprofit clients to solve a community concern. Dr. Jinny Rhee, the associate dean for undergraduate students in the College of Engineering, initiated the program last spring. One team developed a software program called “Study Buddy” that will allow computer science students to text questions to IBM’s supercomputer Watson and receive answers. A second team continued through 2017 with a project started by students in the spring 2016 pilot program. The students are working to convert an old shipping container into a mobile shower and laundry facility for the homeless. The initial team moved the container from the Port of Oakland to the Engineering building courtyard by outfitting it with axles, wheels and a hitch. They installed the initial shower and laundry fixtures, attaching solar panels to it. This year’s team is working on adding insulation to the unit that is equipped to provide showers to 14 clients a day. The students received donations from the Gilroy Compassion Center, SJSU and Sunpower, and also launched a GoFundMe campaign. Another set of students is working on creating an electric vehicle charger with parameters set by Dr. Fred Barez, the chair of Aviation and Technology. The program is expanding to include an upper and lower division course so seniors will have an opportunity to mentor peers while first-year students will have a chance to do relevant community service, according to Keith Perry, the professor who is teaching the class.